The Hudson Valley comprises the valley of the Hudson River and its adjacent communities in the U.S. state of New York, from the cities of Albany and Troy southward to Yonkers in Westchester County. Depending upon its definition, the Hudson Valley encompasses a growing metropolis which is home to between 3 and 3.5 million residents centered along the north-south axis of the Hudson River. 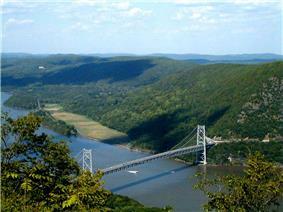 The Lower Hudson Valley cuts through the Appalachian zones of the eastern United States. During the last ice age, the valley was filled by a large glacier that pushed south as far as Long Island. Near the end of the last ice age, the Great Lakes drained south down the Hudson River, from a large glacial lake called Lake Iroquois. Lake Ontario is the remnant of that Lake. Large sand deposits remain from where Lake Iroquois drained into the Hudson; these are now part of the Rome Sand Plains. 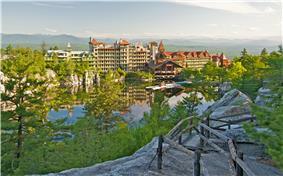 The Mohonk Mountain House in Ulster County, New York was designated a National Historic Landmark in 1986. 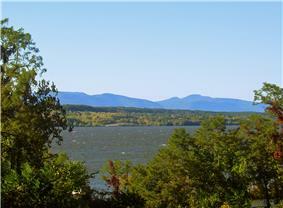 The Catskill Mountains seen from across the Hudson River. At the time of the arrival of the first Europeans in the 17th century, the area of Hudson Valley was inhabited primarily by the Algonquian-speaking Mahican and Lenape Native American peoples, known collectively as River Indians. The first Dutch settlement was in the 1610s with the establishment of Fort Nassau, a trading post (factorij) south of modern-day Albany, with the purpose of exchanging European goods for beaver pelts. Fort Nassau was later replaced by Fort Orange. 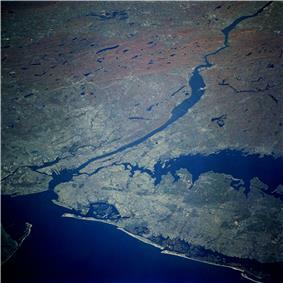 During the rest of the 17th century, the Hudson Valley formed the heart of the New Netherland colony operations, with the New Amsterdam settlement on Manhattan serving as a post for supplies and defense of the upriver operations. The valley became one of the major regions of conflict during the American Revolution. Part of the early strategy of the British was to sever the colonies in two by maintaining control of the river. 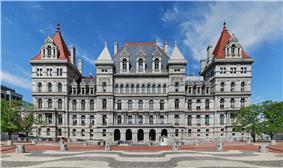 In 1797, the state capital of New York was established permanently at Albany. The natural beauty of the Hudson Valley has earned the Hudson River the nickname "America's Rhineland", a comparison to the famous 40 mile (65 km) stretch of Germany's Rhine River valley between the cities of Bingen and Koblenz. A similar 30-mile (48 km) stretch of the east bank in Dutchess and Columbia counties has been designated a National Historic Landmark. Tech Valley is a marketing name for the eastern part of New York State, including the Hudson Valley and the Capital District. Originated in 1998 to promote the greater Albany area as a high-tech competitor to regions such as Silicon Valley and Boston, it has since grown to represent the counties in New York between IBM's Westchester County plants in the south and the Canadian border to the north. The area's high technology ecosystem is supported by technologically focused academic institutions including Rensselaer Polytechnic Institute and the State University of New York Polytechnic Institute. 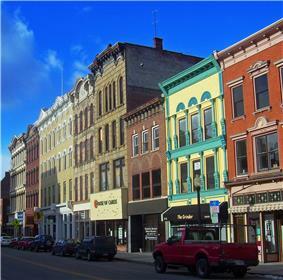 Tech Valley encompasses 19 counties straddling both sides of the Adirondack Northway and the New York Thruway, and with heavy state taxpayer subsidy, has experienced significant growth in the computer hardware side of the high-technology industry, with great strides in the nanotechnology sector, digital electronics design, and water- and electricity-dependent integrated microchip circuit manufacturing, involving companies including IBM in Armonk and its Thomas J. Watson Research Center in Yorktown Heights, GlobalFoundries in Malta, and others. Although sizable Orthodox Jewish communities are located throughout the United States, the majority of American Orthodox Jews live in New York State, particularly in the New York City Metropolitan Area. 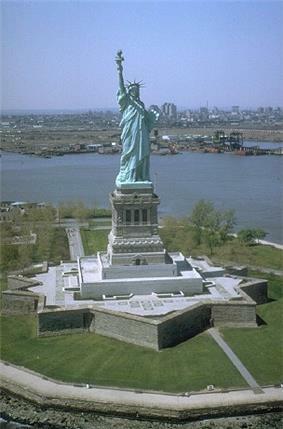 Two of the main Orthodox communities in the United States are located in New York City and Rockland County. The most rapidly growing community of American Orthodox Jews is located in Rockland and Orange counties in the Hudson Valley, including the communities of Monsey, Monroe, New Square, and Kiryas Joel. The Hudson Valley is divided into three regions: Lower, Middle, and Upper. The following is a list of the counties within the Hudson Valley sorted by region. 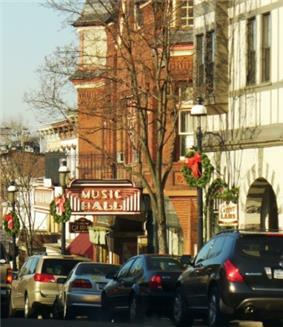 The Lower and Mid Hudson Valley is typically considered part of the Downstate New York region due to its geographical and cultural proximity to New York City. The Hudson Valley is served by Interstate 87 (the New York State Thruway), Interstate 95, Interstate 287, and Interstate 684. Parkways in the region include the Bronx River Parkway, the Cross County Parkway, the Hutchinson River Parkway, the Saw Mill River Parkway, the Sprain Brook Parkway, and the Taconic State Parkway. 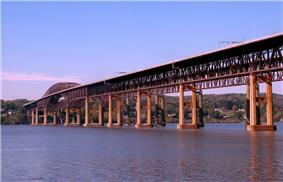 The Tappan Zee Bridge connects Tarrytown, New York in Westchester County to South Nyack in Rockland County across the Hudson River. A $4 billion replacement bridge began construction in 2013. The Bear Mountain Bridge crosses the Hudson River from Cortlandt in Westchester County to Bear Mountain State Park at the northern edge of Rockland County. The combination of these numerous highways, proximity to New York City, and the region's large population all lead to substantial traffic enforcement. Commuter rail service in the region is provided by Metro-North Railroad (operated by the Metropolitan Transportation Authority). Metro-North operates three lines in the region; west to east, they are the Hudson, the Harlem and the New Haven lines. These are former operations of the New York Central and the New York, New Haven and Hartford railroads, each of which stops in the Bronx between Westchester and Manhattan. Amtrak serves Croton-Harmon, New Rochelle, and Yonkers. There are proposals for a cross-county rail line to connect all three lines and provide easier access to Stamford, Connecticut. NY Waterway also operates a ferry service between Haverstraw in Rockland County and Ossining. Westchester County Airport is adjacent to White Plains. The Hudson Valley Renegades is a minor league baseball team affiliated with the Tampa Bay Rays. The team is a member of the New York - Penn League and plays at Dutchess Stadium in Fishkill. The Rockland Boulders of the independent Can-Am League play in Rockland County. ^ "National Historic Landmarks Program - Lake Mohonk Mountain House". National Park Service. Retrieved 2012-09-03. ^ Ruttenberg, Edward Manning (1872). History of the Indian tribes of Hudson's River: Their Origin, Manners and Customs, Tribal and Sub-tribal Organizations, Wars, Treaties, etc. 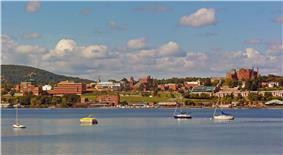 Albany, NY: J. Munsell. ^ Wermuth, Thomas S.; Johnson, James M.; Pryslopski, Christopher, eds. (2009). 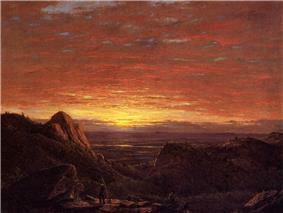 America's first river: the history and culture of the Hudson River Valley. ^ Dunn, Shirley W. (2009). The River Indians – Mohicans Making History. Purple Mountain Press. ^ Gehring, Charles T.; Starna, William A., "Dutch and Indians in the Hudson Valley: The Early Period". Wermuth et al., pp. 13–29. ^ Glatthaar, Joseph T., and Martin, James Kirby (2007). Forgotten Allies: The Oneida Indians and the American Revolution, p. 39. Macmillan. ISBN 0-8090-4600-8. ^ Hirschl, Thomas A.; Heaton, Tim B. (1999). New York State in the 21st Century. Greenwood Publishing Group. pp. 126–128. ^ Dunwell, Francis F. (2008). The Hudson: America's river. ^ Collins, Clay (2011-01-01). "Venison juniper berry marinade". ^ a b "About Tech Valley". Tech Valley Chamber Coalition. Retrieved 2009-09-27. ^ Freeman Klopott, Xu Wang, and Niamh Ring (September 27, 2011). "IBM, Intel Start $4.4 Billion in Chip Venture in New York". 2011 Bloomberg. Retrieved July 12, 2015. Donaldson Eberlein, Harold; Van Dyke Hubbard, Cortlandt (1942). Historic houses of the Hudson valley. New York: Architectural Book Pub. Co.
Hudson Valley Health Systems Agency (1993). Health Maintenance Organizations in the Hudson Valley Region. 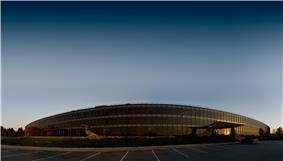 Tuxedo, NY: Hudson Valley Health Systems Agency. Jacobs, Jaap and L.H. Roper (eds.) (2014). The Worlds of the Seventeenth-Century Hudson Valley. Albany, NY: State University of New York Press. Marks, Alfred H. (1973). Literature of the Mid Hudson Valley: A Preliminary Study. New Paltz, NY: Center for Continuing Education, State University College. Mylod, John (1969). Biography of a River: The People and Legends of the Hudson Valley. New York: Hawthorn Books. Wallkill Valley Publishing Association (1904). 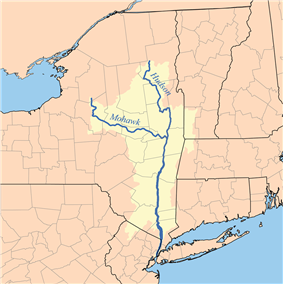 The Historic Wallkill and Hudson River Valleys. Walden, NY: Wallkill Valley Publishing Association.